The Reynolds are business people. One of my friends daughter said one day. Yes, we are business people. Actually, I like to say we are in the business of serving people. My 7 year old, Olivia, definitely has her parents strong entrepreneurial streak…even at a young age. Sunday night we mentioned that on Memorial Day it is a big day for dogs to be picked up. We got out the chocolate chips….some sugar and flour. What I love is Olivia’s attention to detail. She choose her business location right next to the Reynolds Kennels sign so everyone knew who she was working for and her customers park there to pick up their dogs. She made a sign not only to hang for the table but one that would sit on the top of the table…just in case her customer stood to close to the table and they couldn’t see that sign anymore. Samantha contributed the OPEN/CLOSE idea. Boy, I know they are cute…Admit it..it would be really hard not to buy a Kennel Kookie! After paying for their product ingredients and a little tithes to serve others…they earned a big 2.50 each! 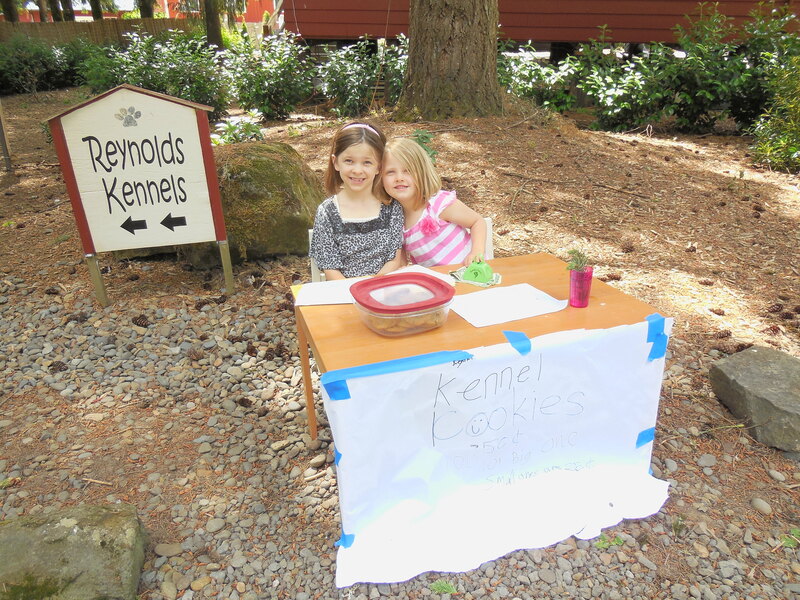 Excellent first day of business…100% profit margin…1,000,000% smiles and fun. Watch out business world…Olivia is growing up!